It’s true. Specialty lists often get double (or even triple) the results of general mailing lists. Yet most marketers don’t know this. They’re still hoping to get the same outcome from generic business or consumer lists. Want to get in front of the people most likely to buy – and act on your marketing, sales and research efforts? Invest a little more in your list. This one thing can really make a huge difference. 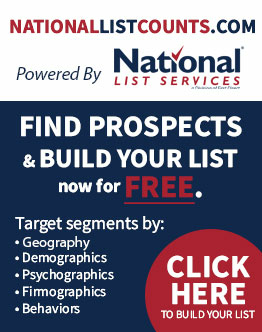 Choose from 65,000+ specialty lists on the market today. Call us. Leverage our dependable experts to recommend just the right list for your unique objectives. Benefit from our industry-leading experience and negotiating power. National List Services works closely with the leading publishers and database managers. The result? If your ideal list exists, we have it or can get it – at a very reasonable price. Guaranteed.